The first Techfugees Global Challenges was open to innovative projects responding to the needs of displaced populations and building technological products or services addressing their needs in one of Techfugees’ five focus area: access to rights and information, health, education, employment and social inclusion. 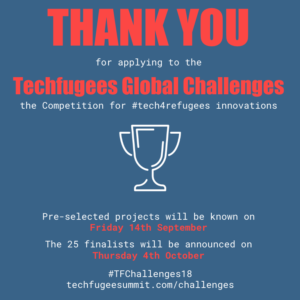 Applications were then shared with an international Jury of experts who selected the 25 finalists invited to pitch their project in front of an international Jury and Techfugees Global Summit attendees on October 26 at Station F in Paris. We received applications from across the world, from countries affected by the conflict & climate change migrations to the neighboring countries and host countries. 52 countries represented in total, with several projects being replicas of others. These facts show two things: first that the Techfugees community is truly global, involving displaced people and people affected by displacement; and that replicas, like multiple discoveries, are happening because the needs of refugees across borders are the same, only the solutions need to be tweaked and adapted to the local context. We are proud that 3 years down planting the seeds of a #tech4refugees movement through hackathons around the world, we are starting to harvest the best projects and supporting them with sustainable partnerships in 2019.  Integreat (Germany – 2015) is an information app and website tailored to the specific needs of both newcomers as the users of the app and municipal administrations as the content providers. They believe to add value to the process of integration by facilitating the flow of information from municipalities to newcomers using the medium most natural to them – the smartphone. They provide a multilingual app with an one mode, as neither German skills nor a data at rate are common among new arrivals. However, Integreat are aware that there are some newcomers without smartphones. In this case the newcomers as well as counselors can access all information through the web app on a computer and print out relevant topics easily through the PDF export function. Content is managed by the municipalities. Integreat combine the app (frontend) with an intuitive content management system (backend). When a municipality decides to use Integreat they get their own instance within the app to ll with locally relevant information. The whole process is supported by the experienced Integreat team through an advanced workshop concept and annual nationwide conferences with the opportunity to exchange experiences and best practices with other municipalities implementing Integreat. Besides all services provided to the municipalities, Integreat is also developing several features to increase the impact for the target group of the newcomers. The first feature to be implemented has been the integration of existing job and internship search platforms. A brokerage platform for housing for newcomers is in pilot testing at this very moment to facilitate the local housing markets. Tikk Talk (Norway – 2016) is an open marketplace for interpretation services for everyone who is in need for interpretation assistance. So far the platform handels 80% of all assignments automatically, limiting the overhead costs which traditional agencies have. The platform also gives all parties full transparency which empowers them to make better decisions. Because of the tech, interpreters are in the forefront deciding on their wage and which assignments they would like to take. Before, Helse Førde (Hospital partner) switched to TikkTalk they only received 24% qualified interpreters now they receive 99% qualified interpreters.  (United Kingdom, France, Greece – 2018) – Working in partnership with French organisations and lawyers, Refugee Info Bus will shed light on the myths and confusion surrounding French immigration and asylum law and offer virtual support during the isolating and confusing period of having just arrived in the country. Topics covered will include what is asylum; the screening interview; the substantive interview; appealing a negative decision; preparing in case of detention; what is Dublin III and Family Reunion rights; as well as details of groups where refugees can access support across France. A series of videos will be filmed in an audio-visual format that caters to a population which speaks a number of different languages and possesses varying levels of literacy. Refugee Info Bus will combine the expert legal knowledge of French asylum lawyers, with a team’s video making, language skills and first had experience of navigating the hostile, confusing and discriminatory asylum process. The use of social media platforms to share this video content will ensure that it is reaching the widest possible audience, overcoming the frequently alienating process of seeking legal advice and circumventing the fear of cost and reprisal.  (Greece, Bulgaria, Hungary, Serbia – 2015) – In mid-2016, Refugee.Info pivoted to focus on social media to better serve the needs and preferences of users, which had drastically changed after borders closed in Europe in March of that year. Research conducted as part of a human-centered design process showed that users wanted to get information on a platform they were already using, Facebook, and to get more news and less static information. The IRC partnered with NaTakallam to recruit a team of Facebook moderators from among their online Arabic-language teachers, and the rst-ever refugee Facebook response was created. Refugee.info also hired local journalists to obtain and verify news and other up-to-date information about the context, as well as content professionals to optimize the information for social media, applying private sector content marketing principles to increase ROI. Then they contracted legal organizations to answer questions from our users and help produce content. Now, refugees in Greece, Italy and the Balkans can message the page and receive a quick answer from a moderator who will work with the journalists and lawyers to provide accurate information, often sourced from their website or blog. – The “Get Informed” section provides information for users concerning Iran’s immigration policy, the rights of Afghans in Iran, and resources that are available for concerns such as health, education, combatting from discrimination and more; the list continues to expand as users share their needs. The section also provides a list of support groups that our team has verified directly. – The “Submit Report” feature enables users to share their everyday experiences as Afghans in Iran and support the larger community in addressing challenges by sharing information on events and experiences. The information on the app is also accessible offline, so as to support those without regular internet access.  The platform of Connect2Drs (Mexico – 2018) was initially built to strive the private sector as a target market, and it still is. However, with the injustice and lack of a good health insurance for mexicans – deported or refugees – people with disabilities and people who need medical attention at home with palliatives became their main goal.  Doctor-X (Jordan, 2018) is a multi language medical history mobile application and website with, for each refugee, a private account that the doctor can update when he does an operation on the refugee, in the language the doctor speaks. The program will make it available in 5 languages in case the refugee goes to a new country and needs medical help.  Until now, medical workers in camps used Excel spreadsheets to make notes about patients. On top of that, medical workforce turnover is high, bringing additional confusion and inconsistency to Excel records. Iryo (Jordan – 2018) enables accurate medical history recording. Because data storage is decentralized with a copy on a local server, a second one on the patients mobile phone and a third one in the Iryo cloud, even if a patient arrives at a new refugee camp where the Iryo system is already in place, the doctor there will be able to access the patient’s record.  MedShr (UK/Worldwide – 2016) has been developed to enable doctors and healthcare professionals to share and discuss clinical cases for peer-to-peer learning and medical education. It is a private, professional, verified network for clinical case discussion between medical professionals. No patient information is visible, all cases are anonymous and members can use the mobile-app to get consent from patients to share images. Beyond that, all images and media are securely cloud stored with no images stored on the user’s device. Importantly, MedShr members are also able to determine who can see and discuss their cases. MedShr is providing a number of doctor groups and organizations, including Health Poverty Action and Doctors of the World, a platform for peer-to-peer discussions around patient cases and learning cases so that those in the field are appropriately trained and up to date. Shifra (Australia, USA – 2015) is not only a life-saving mHealth intervention, it is also a research project which aims to explore the social, cultural and geographic barriers to quality healthcare access many refugees experience, as cited by the refugees themselves. The Shifra web app is designed to improve access to quality sexual and reproductive health care. It provides local, evidence-based health information in multiple languages for communities with varying levels of language and health literacy. Shifra also directs users to trusted clinics where they can access respectful and safe care. We work with local health networks to improve their existing services based on the self-identified health needs found in Shifra’s anonymous user trend data. Antura and the Letters (Syria, Lebanon, Jordan, Turkey, Iraq and Egypt – 2017) is an engaging mobile game that helps Syrian children learn how to read in Arabic and improve their psychosocial wellbeing. Considering that most refugees have old smartphones and connectivity is always a challenge for them, the game runs on old devices (from 2010/2011), it’s very small to download (less than 80Mb on Android) and it does not require internet connection. Antura and the Letters is completely free and open source… and it has been designed in order to be easily adaptable to other languages! That’s exactly what we want to do next with the goal to reach and help as many children as possible around the world. building a network for higher education of refugees to address policy issues, mentor students. Paper Airplanes (United States / Turkey, Lebanon, Jordan, KSA, Egypt, Iraq, Palestine – 2014) is a nonprofit that uses video conferencing technology to provide free, peer-to-peer language and professional skills instruction to young adults and teens affected by conflict in the Middle East and North Africa. PA works to support these individuals to pursue their educational and employment goals and ultimately rebuild their lives. PA teaches English and Turkish to youth and adults, journalism to citizen journalists, and beginners’ coding skills to women. By using virtual communication technology to provide live instruction, PA is able to reach internally displaced and refugee youth as well as underserved populations who may be otherwise difficult to reach, including those inside Syria (approximately 50% of our students), young women and girls, and individuals in rural areas across the MENA region. Additionally, PA supplies computer tablets for select Youth Exchange Program participant recipients and scholarships to defray the cost of the IELTS and TOEFL exams for qualified PA graduates. Powercoders’ solution (Switzerland – 2017) is to offer intensive computer programming classes to refugees over a three month period and then place them in an IT internship. As a result of the comprehensive training and subsequent placement, within a little less than a year our refugee graduates are exponentially better positioned to find and keep an IT job in Switzerland, and many do just that. The program is fully customized to address the challenges and issues that refugees may face when trying to integrate professionally and the courses enjoy an almost 100% internship placement success rate and subsequent 80% integration rate. Firstly, the curriculum teaches industry-demanded skills, with the final weeks of the course dedicated to learning the specific technical skills required in the internships the students secured. This ensures that the students have the right skills, making them valuable and desirable employees. The program contacts potential employers beforehand, securing commitments of interest and organizing sessions where employers can meet the students, interview them and eventually offer them an internship. This allows refugees to access and connect to employers and opportunities that they normally would not be able to. The program also addresses the issue of cultural expectations and soft skills in the workplace in two ways. It does so firstly by holding social skills and business workshops every Wednesday, offering training in interviewing, applications, communication, tech workplace expectations and more. Secondly, Powercoders pair students with their own individual job coaches, all of whom work in Switzerland and act as a source of advice, friendship and social support throughout the course and internship. Another important dimension is to ensure that a sense of community, friendship and support is the foundation for the team and class, and they do so by organizing weekly social and cultural activities. RefugeeEd.Hub (Greece – 2018) is an open source online database that promotes promising practice in refugee education globally. RefugeeEd.Hub aims to raise the quality of education for refugees and displaced people by generating knowledge and fostering collaboration among global and local stakeholders working to provide education to refugees. RefugeeEd.Hub will support education innovators, multilateral institutions, global development actors, education funders and government and policymakers to inform practice on the ground. Bitae Technologies (United States, Jordan – 2017) aims to help global, mobile talent, like refugees and migrants, carry their skills and experience with them in a secure, verified digital CV, addressing the lack of access to formal education and employment faced by refugees and other vulnerable populations. Bitae transforms non-formal learning and achievements into opportunities for refugees. We provide a platform to track, store and verify refugees’ non-formal learning and skills, creating a “digital backpack” of classes, workshops, internships and skills that together, can help a refugee move forward with education and employment. Bitae leverages mobile and blockchain technology to ensure that governments, international organizations, NGOs, educational institutions and employers are able to document non-formal learning and skills in the most inclusive, secure and transparent way. The Digital Backpack focuses on four key functions: creating badges and verifying skills, requesting and sending references, skills matching and skills assessment. Using existing tools, the platform makes it possible to create blockchain-backed credential badges that can be stored and shared. Human in the Loop (Bulgaria – 2017) is a social enterprise which employs and trains refugees to provide image annotation services to computer vision companies. It is a niche market that currently requires manual human input in order to train ML models to recognize images in a way that a human would, and Human in the Loop are part of a growing community of “impact sourcing” enterprises that is dedicated to providing employment to vulnerable groups in this sector. The opportunity they are seizing is that image annotation is a very accessible type of labor that does not require previous education or professional skills, but which can open the door to more advanced tech jobs and freelancing skills, which are especially useful for migrants. In this way, they are empowering refugees to earn a living in a dignified way and gain skills, and they are turning them in “digital nomads” who are able to make use of the opportunities that remote digital work provides to people who are on the move. Human in the Loop works as an outsourcing business with B2B sales. Their clients are companies from the computer vision, self-driving cars, drones, and satellite imager industry, which are training machine learning models. Rafiqi (United Kingdom, Germany, Jordan – 2018) is a matching tool that leverages artificial intelligence to connect refugees in real-time and in a customized way to the opportunities that are the most suitable to his/her profile and that would lead to lifelong employment. Currently, there is no single platform where resettled refugees can access and filter the wide range of opportunities available to them, including jobs, training, mentorships and degrees, and where any organization (company/NGO/university) can seamlessly access and filter refugee talent. Refugees lack of knowledge of opportunities and of the right opportunities is resulting in them being unemployed or being overqualified for what they are actually doing. Despite the existence of some refugee to jobs matching programs supported by governments and NGOs in countries like Germany and the Netherlands, these matchings remain largely manual and limited in terms of intelligence. These matching efforts cannot scale well given the high number of refugees and the diversity of their profiles, as well as the diversity of opportunities available to them. The Rebuild Lives Program by Transformify (Worldwide / EU, Iraq – 2015) exists to provide access to jobs and secure payment to displaced people as well as access to targeted eLearning to improve their skills by using recruitment CRM leveraging HR-tech, fintech and AI to connect refugees with employers and provide access to secure payment even if the refugees have no permanent address or a bank account.  In the era of machine learning and artificial intelligence, the data workers and annotators are the new programmers. From robots, drones, self-driving cars or e-commerce, the markets need for vision technology for artificial intelligence is extraordinary. One of the major building blocks of such AI-powered recognition systems is image annotation delivered with a human input – data training. Today’s data is driving tomorrow’s AI products. To be competitive in AI, innovation depends on having data-edge often more than a technology-edge, but 80% of data engineers’ time is spent on sourcing and preparing quality image data for AI models. TaQadam (Lebanon – 2018) optimizes image annotation for data-driven companies with visual AI and delivers on-demand, vertical-specific, high-quality image annotation. With an API and a cloud architecture, we ensure a simple and secure way to build image data set with a high accuracy and precision, while simplifying the process of sourcing human insights from dedicated and trained teams of TaQadam. TaQadam is a unique service on the market that brings a specialized on use case teams that are building AI together with the client. With gamification and mobile accessible work on TaQadam Android App, we transform the experience of annotation to fit the younger generations. We create work of the future: accessible, flexible, allowing fluidity, community building and fun. PLACE (France, Germany, United Kingdom – 2016) runs Innovation Labs for migrants and refugees in Europe. These labs transform the people from migrants and refugees into Innovators – creators of solutions for European societies. The labs are 1 to 3-day immersive experiences that apply design thinking methodology to enable Innovators to identify problems, understand their users, develop solutions and then rapidly test and prototype these solutions with a diverse community of local stakeholders. Beyond the Labs, the Innovators have the opportunity to develop their projects through the network of the PLACE collective – actors in the private, public and civil society that see the value of diversity in migrant-led innovation and who want to be a part of it. In addition to innovative solutions, the labs also produce a new leadership model for Europe. Innovators who demonstrate motivation and willingness to take on a role as a leader in migrant-led innovation are trained to be PLACE Catalysts. The Catalysts are trained in interculturality, sourcing, public speaking, networking and lab facilitation. They are then given the opportunity to apply these learnings as facilitators in Labs throughout Europe. Evolve and open-source our Case Management System, to optimize Service User outcomes. SchoolX (UK/Turkey – 2018) envision a shared economy model with volunteer teachers which include university students, educated refugees, retired teachers and other local volunteers, who will teach refugee students. Due to the challenge of limited access to education that these displaced people face, our solution is to recruit teachers within the refugee community and local community, and connect them with refugee students who are eager to learn. The talents of these teachers are then harnessed to deliver rigorous and certified education to the students. Through this, volunteers, including refugee teachers, will also receive an allowance for their efforts as well. The solution, in a form of an online platform, will provide training packages that involve not only fundamental tenets of teaching, but also pedagogical and psycho-social training for the volunteers to prepare them to approach refugee children in the most appropriate and empowering manner, The online platform will also serve as a database which will be utilized to match teachers and students based on their needs, skills, availability, and geographical proximity in order to arrange flexible, face-to-face lessons. SPEAK (Portugal, Spain, Italy, Germany – 2014) is a crowdsourced language and culture exchange network, based on an Online2Offline model. All processes are managed online, through a platform developed in-house, while the learning and sharing experience happens offline, allowing participants to establish a close relationship with one another. This model ensures a greater efficiency and minimization of fixed costs, allowing SPEAK to be sustainable at scale while charging only a symbolic fee for its program. SPEAK empowers its participants by expanding their language and cultural skills, all the while becoming part of mutual support networks. Through a language and culture exchange, SPEAK connects migrants, refugees and locals living in the same city. In creating bridges between migrants and locals, members often help each other with job offers or renting their first house in a new city thanks to the power of SPEAK communities. These networks are home to a multicultural community, based on equality and where cultural heritage is validated. In other words, SPEAK’s networks nurture unity in diversity. SPEAK’s volunteer Buddy system empowers anyone with the willingness to share their language and culture, allowing for an “everyone a changemaker” attitude, which encourages an even greater participation in local public life. The sustainability of the initiative relies on the community and willingness to promote SPEAK’s values of an integrated and inclusive society. SPEAK also offers social entrepreneurs a platform for impact, especially those who do not have opportunities easily. An example is Khouloud: an inspirational young woman from Syria living in Braga who wanted to help other migrants and refugees feel included in their new city. To do this, SPEAK supported Khouloud by means of crowdfunding to facilitate the opening of SPEAK in her city (Braga, Portugal). As seen in Khouloud’s example, SPEAK works in such a way that members of the community are part of their own transformation and integration process.